Marketplace is simple shop with spirits, heroes, promotion stones, hero shards, equipment, summon scrolls, arena tickets and chips. Idle Heroes Strategy Game Guide. 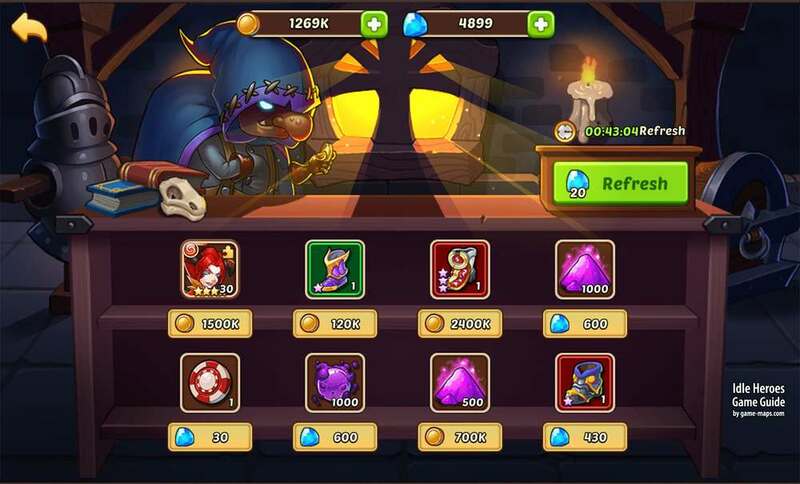 Marketplace is simple shop with spirits, heroes, promotion stones, hero shards, equipment, summon scrolls, arena tickets and chips. The market refreshes item every 3 hours. You can also refresh them manually for 20 Gems. Equipment sold in the Marketplace scales up with player levels. Marketplace is not particularly useful. It also makes no sense to refresh him for gems. "buy casino , Heroic Scroll, Quest scrolls, arena tickets By GOLD. if u are high vip u can buy with gems"